With the Girls Flag Football season here, that means some gridiron action is back for the next two and half months in some form. A lot of things happened 2017 across the entire state that made for some interesting talk in the sport, but now with 2018 here, there is talk about what is going to happen now. Can Robinson keep the win streak going and win a third-straight Class 1A state championship? Robinson knows that the bullseye is squarely on them in Class 1A this year and will carry the largest of the two bullseyes of the defending state champions. The Knights also hold a 28-game win streak, which is now the longest in the state after Seminole Ridge’s 52-game win streak was snapped by Plant in the Class 2A state championship last year. The Knights are replacing a lot of their key players that made up the 2016 and 2017 state championship teams, but there is still enough that this should be a reload season and not so much a rebuild. You can check out the Class 1A rankings, which Robinson checked in at No. 1 here with a team outlook included as well. Does Plant have what it takes to repeat in Class 2A as state champions? Some feel Plant might have lucked out and had their best team last season, but truly that run had started building when the reached the state semifinals in 2016. Having taken down the king of Flag Football in the Sunshine State by snapping Seminole Ridge’s 52-game win streak, the Panthers will have a lot of work to do to keep the title sitting there in South Tampa. The biggest question will be if Alonso becomes a big headache with the considerable offseason progress they had. We will soon get that answer on March 20, when both go to head-to-head for their District 2A-7 matchup. You can check out the Class 2A rankings, which Plant checked in at No. 1 here with a team outlook included as well. The tournaments do truly mean something, right? There are two important tournaments we are keeping an eye on and both we plan to be involved in some form or fashion and that is the Second Annual Bloomingdale Tournament at Bloomingdale High in Valrico on March 23-24 and the Eighth Annual Capital City Classic in Tallahassee at the Florida State University Recreation Fields hosted by Godby High and Rickards High on April 6-7. Both tournaments represent the best chances for teams to compete with teams from outside of their own area and their own comfort zone, which has helped prepare many teams later on for the challenges of the district tournaments and the playoffs. The biggest question is, can Robinson repeat as the champion at the Capital City Classic for the second straight year? That all depends on who they match up with when brackets are revealed later this month. What is in a district? A lot of teams. Maybe even a side of subdistricts as well. For the third straight season, both classifications will see an increase in the number of teams as most programs in Manatee and Marion Counties make the jump into district play for the first time. As such, districts like District 1A-5 was forced to split automatically with 13 teams, while District 1A-13 did not split with 12 teams, leaving teams in that district the ability to schedule only one outside team. With many more districts going the route of using the subdistrict format, could it be time that the FHSAA looks at adding a third classification in Flag Football? That could be the case, especially if schools in Suwannee, Lake and Sarasota County all add Flag Football in the next couple of years. 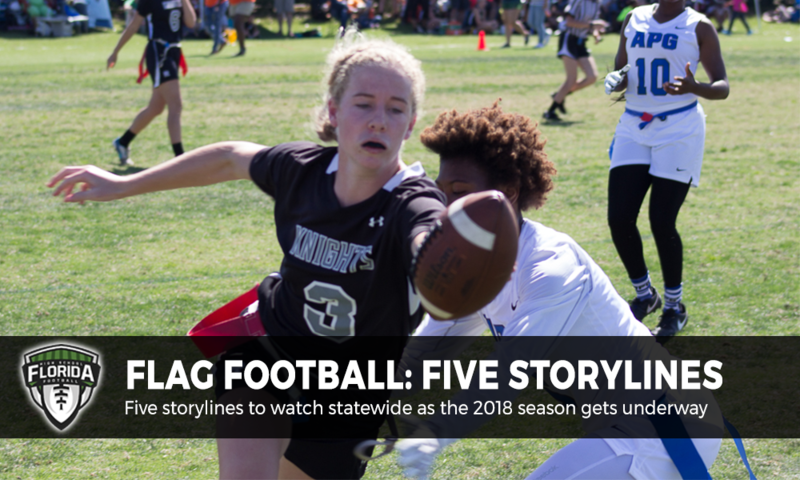 Where will the FHSAA Flag Football State Championships held at this year? The Flag Football State Championships have not had a solid home in any one location since Gene Cox was the host in 2012 and 2014-15. In 2016 the state championships were held at Robinson High School in Tampa, while last year the championships were held at Citizens Field in Gainesville. FloridaHSFootball.com has been told by multiple sources that the location of this year’s Flag Football State Championships will be somewhere in the South Florida region (West Palm Beach to Miami). Currently, the only thing released so far by the FHSAA is that all state semifinal and state championship games will be played in a one-day format on Saturday, May 12. When the location is announced, we will post that here on FloridaHSFootball.com.